Many have attempted to explain the inspiration and origins of Charles Darwin’s theory of evolution by natural selection. One recent attempt comes from Dominic Klyve in his 2014 article “Darwin, Malthus, Süssmilch, and Euler: The Ultimate Origin of the Motivation for the Theory of Natural Selection,” published in Journal of the History of Biology. While Darwin was undoubtedly inspired by Thomas Malthus’ Essay on the Principle of Population, Malthus’ own ideas about geometric population growth derived from the work of German Protestant pastor and demographer Johann Peter Süssmilch (1707-67) and Swiss mathematician Leonhard Euler (1707-83). According to Klyve, it is here, in the work of Süssmilch and Euler, where we find the “ultimate” origins of Malthus’ geometric theory, and therefore Darwin’s theory of evolution by natural selection. According to Klyve, Darwin needed three things to rightly conceptualize his theory of natural selection: time, rapid population growth, and stability. While the old age of the earth was demonstrated by Lyell’s work, the other two pieces come from Süssmilch and Euler. While Klyve may have secured a spot for Euler in the intellectual history of Darwin’s work, I am more convinced that another mathematician may have played a similar, if not greater, role in Darwin’s ideas: Charles Babbage. This past week I have been reading Laura J. Snyder’s engrossing tale of the Philosophical Breakfast Club: Four Remarkable Friends who Transformed Science and Changed the World (2011). The Philosophical Breakfast Club was the creation of four Cambridge men, William Whewell (1794-1866), Charles Babbage (1791-1871), John Herschel (1792-1871), and Richard Jones (1790-1855). These four Cambridge friends met together on Sunday mornings after chapel to discuss Francis Bacon, reforms in knowledge, society, and science. 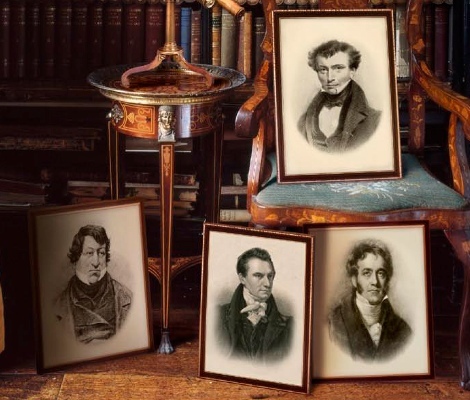 All four would become central to the founding of the British Association for the Advancement of Science (BAAS) in 1831. These parties were also something of a gastronomic affair (much like the BAAS meetings were). According to Snyder, a “table would be laid with punch, cordials, wine, and Madeira; tarts; fruits both fresh and dried; nuts, cakes, cookies, and finger sandwiches…oysters, salads, croquettes, cold salmon, and various fowls.” There was also dancing, music, and literary, artistic, and scientific amusements. But most important of all was Babbage’s demonstration of his Difference Engine. Ignoring for the moment Babbage’s own god-complex, his image of God as programmer, who had, as Snyder puts it, “preset his Creation to run according to natural law, requiring no further intervention,” would lead to a remarkably different view of the relationship between science and religion in the nineteenth century—one that would dramatically alter Darwin’s own view of God’s agency in the natural world. Just as Babbage anticipated changes and modifications in his machine, he imagined God as a programer and inventor, who would have anticipated changes in creation. Darwin, Snyder suggests, “would have seen how Babbage’s view of a divine programmer gave him a way to reconcile his beliefs in God with his growing sense that new species arose from old ones in a purely natural, evolutionary process.” But in time, however, Darwin and many others would come to think that nature did not need a divine programmer at all. I causally opened John Tyndall’s New Fragments (New York: D. Appleton and Co., 1896) this morning on the desktop and was pleasantly surprised by its first entry, “The Sabbath,” a Presidential Address delivered before the Glasgow Sunday Society in October, 1880, which was then quickly published in The Nineteenth Century the following month, and subsequently as a pamphlet in December. I say “surprised” because I knew that Draper and White had made much use of the then emerging comparative religious studies in their work, including new studies on higher criticism of the Bible. But did Tyndall? Indeed he did, and this short essay demonstrates this physicist’s wide reading in the new emerging field. Calling all sermons contrabands, In that great Temple that’s not made with hands.